If you're a long-time follower of my blog, you know that I consider what I wear to be part of my identity (view my talk about it here). To me, fashion can speak volumes about your personality and bring you confidence if you let it. When it comes to sporting your college spirit wear, it's no different. There's just something about being able to take pride in your school and represent being part of a community through clothing! I still remember the first day after I committed to USC I was so excited to wear the t-shirt that I bought at the bookstore during my tour. I was delighted when people would ask me about the shirt and I could respond, "I'm starting school there in the fall!" Since then, I've added a lot more garnet to my wardrobe and wearing the Carolina logo means so much more. It means game days, Clemson rivalries, screaming the Gamecock cheer, and it means home. 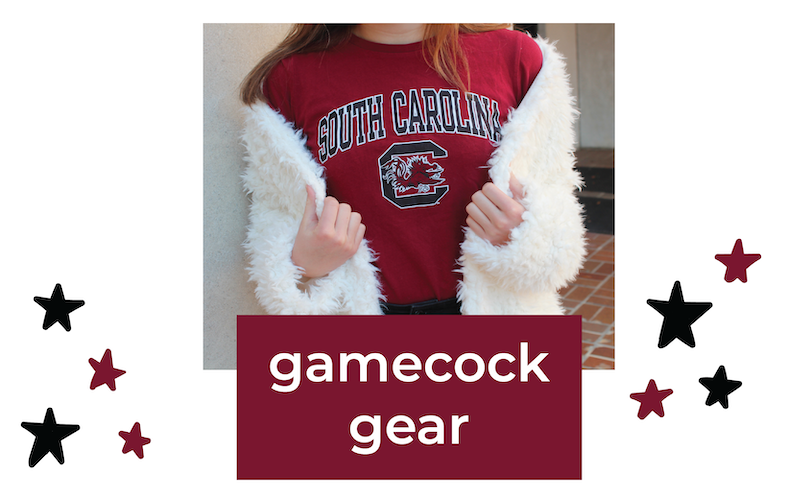 Today on the blog I'm sharing how I style my Gamecock gear as part of a contest to represent UofSC at New York Fashion Week with IMG College Licensing! I'm so lucky to go to a school with such great opportunities like this one. Here I am with our beloved mascot, Cocky! Snakeskin has been trending this season, so I added these snakeskin booties to my look to spice things up. Behind me in this picture is Capstone, my residence hall! It's the best and I hope it glows garnet after the Clemson game today-- signifying a win! Fuzzy coats like this one are my favorite way to stay cozy during the chilly months. I love my Gamecocks and I love my spirit wear -- all available at the Bookstore! loving how you dressed up a classic t-shirt for gameday!